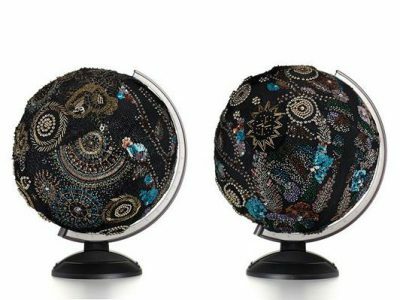 In honor of Art in Embassies 50th Anniversary and Condé Nast Traveler’s 25th anniversary, noted Pakistani-American artist Shahzia Sikander and acclaimed fabric and mosaic artist Nick Cave have designed two special globes. Both artists have collaborated with AIE on multiple projects in the past, including the U.S. Embassy in Karachi and Port-au-Prince. The globes by Shahzia Sikander and Nick Cave were not for auction; they were displayed in the Diplomatic Reception Rooms at the State Department’s headquarters in Washington, D.C. These globes are part of a larger project by Condé Nast, called Visionaries 2012. 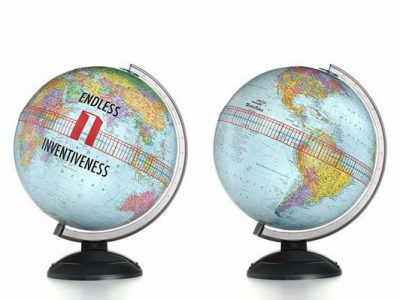 To honor their work as global citizens, Condé Nast asked each Visionary to redesign the traditional schoolhouse globe, adding their own unique perspective. Shahzia Sikander’s Visionary 2012 globe is called ‘Endless Inventiveness’. According to Shahzia, it can be interpreted in multiple ways. It is a reflection on the global interconnectedness of authority and culture. In our world with all its complex problems, where competing interests often coalesce, finding a solution requires creativity. Working in multiple mediums and formats and employing ideas that are often subversive and polemical in nature, Shahzia Sikander interrogates cultural and political boundaries as a space for opening up new frameworks for dialogue and visual narrative. Her pieces are included in the collections of the Museum of Modern Art, the Whitney Museum of American Art, the Solomon R. Guggenheim Museum, and the San Francisco Museum of Modern Art, among many others. She won a MacArthur Foundation Fellowship in 2006. Sikander has also examined the canon of Indo-Persian miniature painting, deconstructing and playing with its context while pioneering an experimental approach to the anachronistic genre. Her work launched a major following in Lahore, Pakistan at the National College of Arts in the 1990’s inspiring many others to examine the miniature tradition. Sikander’s visual vocabulary engages a multiplicity of themes including transformation as narrative, disruption as a means to cultivate new associations, and conceptual issues pertaining to scale, labor, time and translation. She currently lives and works in New York City. Nick Cave is an American fabric sculptor, dancer, and performance artist who is best known for his Soundsuits: wearable fabric sculptures that are bright, whimsical, and other-worldly. Cave finds inspiration in everything from rocket missiles to tree roots; he scours flea markets for the buttons, stuffed animals, and crocheted pot holders he uses to make the wearable sculptures. Trained as a dancer with Alvin Ailey Company, Cave is now director of the graduate fashion program at the School of the Art Institute of Chicago. After graduating in 1982 from the Kansas City Art Institute, Cave went on to get his masters from Cranbrook Academy of Art in Michigan in 1989. He lives in Chicago.